At first, scientists thought it was an “ice-age bison.” More than a decade after it was discovered, the giant ground sloth was mounted for display at the Burke Museum. At first, they didn’t know how interesting a find it was. 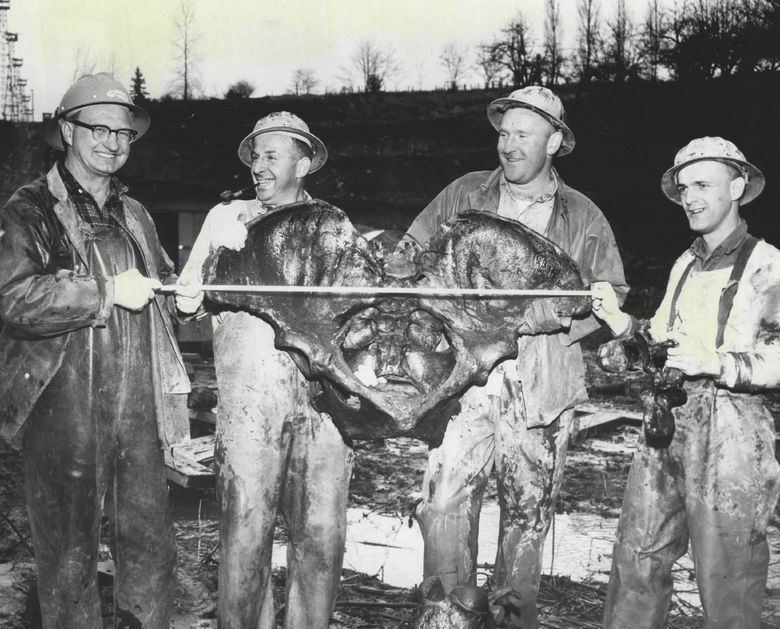 On this day, 56 years ago, The Seattle Times reported that an “ice-age bison” had been discovered in a peat bog at a construction site at Seattle-Tacoma International Airport. The next day, the scientists investigating the fossil revised their story: The bones were actually those of a giant ground sloth. “To my knowledge these are the first from a giant sloth found in the Pacific Northwest,” University of Washington geology professor V. Standish Mallory told the Times. The ground sloth was in remarkable condition, the Times reported. Ground sloths weighing about a ton and featuring sharp claws for defense roamed North and Central American forests until about 11,000 years ago, according to the San Diego Zoo. The beasts stood about 10 feet tall. Researchers were able to find most of the sloth’s bones, but couldn’t locate its skull, the Times reported. About a year later, scientists used carbon-dating technology to estimate that the creature died about 12,700 years ago. The giant sloth became known as “Meg,” for its scientific name, megalonyx. Reconstruction of the giant sloth took many years and required the manufacturing of several missing bones. In 1977, more than 16 years after it was found, the giant sloth (with a few replacement parts) was finally mounted for display at the Burke Museum.